Tinners Way, one of the most successful sons of Triple Crown winner Secretariat, arrived this week at Old Friends, the Thoroughbred Retirement Farm in Georgetown, Kentucky. Tinners Way at Old Friends. Tinners Way (Secretariat x Devon Diva, by The Minstrel) was bred by Juddmonte Farms from Secretariat's final crop. Tinner began his career with a seven-furlong maiden win on British turf in 1992 and continued to campaign in France and England as well as in the US in 1993. With 7 wins from 27 starts, Tinner is best remembered for consecutive wins in the GR1 Pacific Classic at Del Mar in 1994 and 1995. That same year he also captured the Golden Gate Fields Budweiser Breeders' Cup. H, and in 1996 he took the GR1 Californian S.
His career earnings total $1,847,734. He most recently stood at Key Ranch in Salado, Texas. A son of Tinners Way, Riva Way, from the Riva Ridge mare Yia Yia, is also a resident at Old Friends. 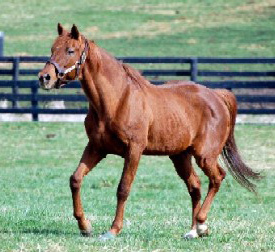 • The remaining Secretariat sons at stud in the US include Akram at Green Meadow Farm in Virginia, Country Side at Diamond J Farms in Texas, Innkeeper at En Avant Equine Enterprises in Pennsylvania, Regal Secret at Harris Training Center in North Carolina, and Thill a Sec at Rieff Thoroughbreds in Wyoming. Country Side is 25 and is still going strong, with mares due to foal this coming northern Spring. 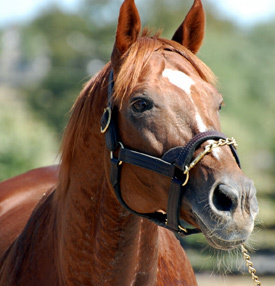 • Another son of Secretariat, graded winner Academy Award, was humanely euthanized on August 24 at Old Friends. Old Friends President and Founder, Michael Blowen, in consultation with Dr Doug Byars and Dr Brian Fraley, made the decision following continuing problems with chronic laminitis. A foot injury prevented Academy Award (Secretariat x Mine Only by Mr Prospector) from competing successfully until his four-year-old year. Bred and owned by Peter Blum and trained by Richard DeStasio, Academy Award won the 1991 Early Times Handicap at Belmont Park and, in 19 starts, won five races and earned $226,943. He originally stood at Claiborne Farm but ended his breeding career at Ohio's Win Row Farm in Lebanon, Ohio. Academy Award sired 9 stakes winners. Academy Award was retired last year with the help of Win Row's Chris Rosell, Secretariat's owner Penny Chenery through the Secretariat Foundation, actress Angie Dickinson and TV producer Barbara Bowen. "Academy Award had a perfect disposition for Old Friends," said Blowen. "And visitors loved the idea that he was Secretariat's son. He was a lot smaller than his sire. We called him Little Red. He will be missed." Old Friends is a non-profit organization that cares for more than 100 retired racehorses. Its Dream Chase Farm, located in Georgetown, Kentucky, is open to tourists daily by appointment.